Here is a quick activity intended as a starter activity to help my students learn to translate the verbs they have been learning in these past few lessons. The game uses ayaat from the Qur’an which fits in well with their syllabus. The game is easy – Tic Tac Toe but with a Qur’anic Arabic twist. Inshallah I’m going to laminate the sheet so that the students can put crosses on the sheet using dry erase board markers. That way this resource can be re-used for many years to come iA. 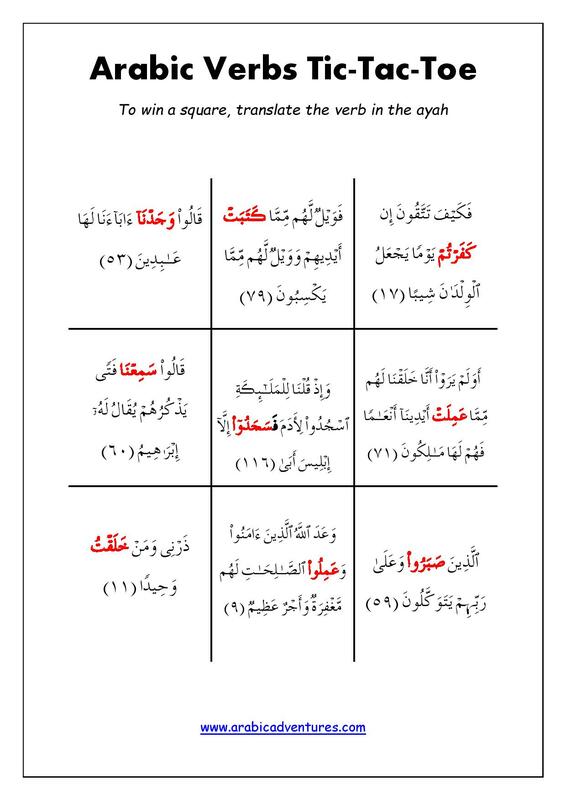 So here is the pdf for the Arabic Verbs Tic Tac Toe activity. This entry was posted in Games and tagged activity, arabic, arabic class games, arabic game, arabic games, arabic grammar, arabic grammar review, Arabic Language, Arabic lessons, arabic past tense, arabic printables, Arabic verbs, fil madi, Qur'anic Arabic, Quran curriculum, quran syllabus, tic tac toe arabic. Bookmark the permalink.